"Sivaro ward 4 is the first in New Ireland to have the Solar street lights installed from the first batch of 100 street lights that arrived in the province in January this year." 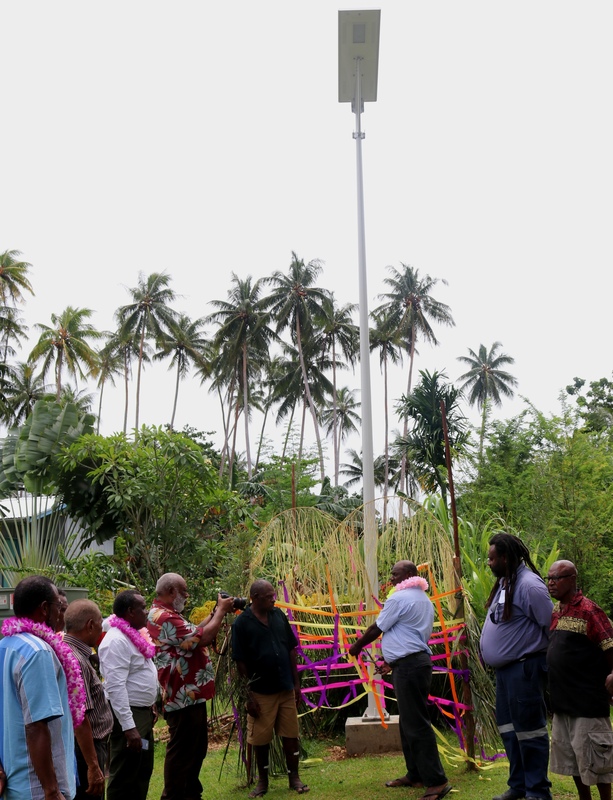 Three Solar Powered street lights were launched at Sivaro ward 4, in the Kavieng urban LLG by the New Ireland Provincial Government (NIPG) last week Wednesday. The launch is part of the NIPG's lighting New Ireland Policy which takes into consideration the use of renewable energy like solar to give light to wards in New Ireland. The launch was witnessed by Governor Sir Julius Chan, Provincial Administrator Lamiller Pawut, CEO’S and Directors of NIPG, other officers of the provincial government and the locals of Sivaro. Sivaro ward 4 is the first in New Ireland to have the Solar street lights installed from the first batch of 100 street lights that arrived in the province in January this year. A solar unit cost over K6000 each. Governor Sir Julius Chan who was the keynote speaker during the launch announced that another 100 Solar street lights have been ordered to cater for all the wards in New Ireland. Going in line with my government’s policy of the further you are the more we care,”relayed Governor Sir Julius. Sir J also announced that next year his government would give k 30, 000 to the ward member and a further authority of K200,000 to the LLG president to support priority projects which the people feel are ofhigh importance. Chairman of Infrastructure Sammy Missen while speaking about the high impact projects currently being delivered by the NIPG called on the people of Sivaro look after the Solar street lights stressing that the Provincial Government had gone out of its way to make the infrastructure available for them. The people of Sivaro expressed gratitude to the Sir Julius Chan Government for implementing the project in their area. One elementary school teacher said the street lights made a huge difference totheir village; the community could hold meetings under the lights at night. Training for the installing of the Solar Street lights also commenced last month with the NIPG logistics team and the contractor JWK Pacific carrying out training for Liason officers. The Liason officers play a very vital role on the ground often being the eyes and ears of the government thus the NIPG moved that their skills capacity be beefed up so they along with their communities take ownership of the Solar lights if it needs fixing or maintenance. Also on the day, Chief of Chiefs and leader of the Government Assembly Demas Kavavugot the Governor to plant a Tanget to erase the name of the village to “ Sivaro”( Good place) instead of “ Sivasat ” ( bad place).